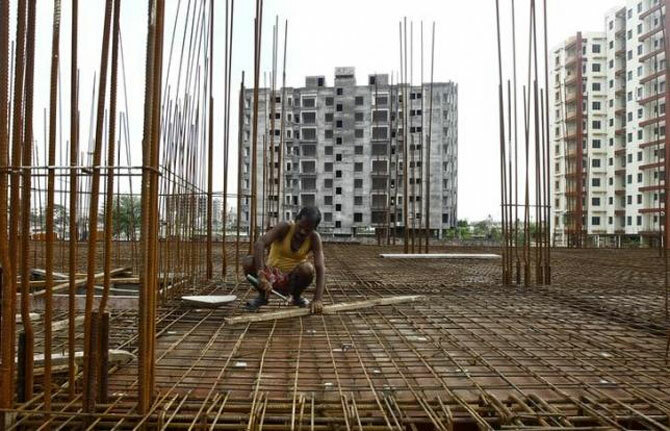 Investment is an important driver of growth in India, but the number of private projects announced and under implementation has been declining steadily since 2011-12. Government project implementation has improved over recent years, but animal spirits remain low. 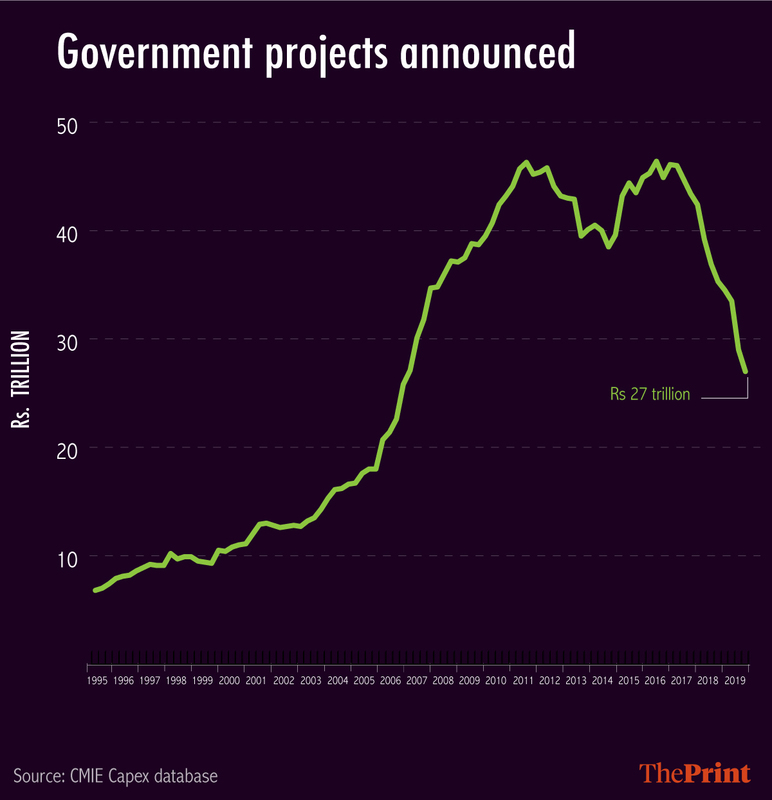 Latest capex data reveals that public projects under implementation have increased but announcements, particularly of private projects, continues to pull down capex in India. A critical factor that shapes business cycle conditions in any economy is investment. Traditionally, business cycles are primarily seen to be investment inventory cycles. Investment as a driver of growth is particularly important in India, when compared to many other countries, given the large share of investment in GDP. One measure of investment is the CMIE Capex database. This data includes all formal sector investment projects in the country. Using this data, we can track a project when it is announced and when the implementation of the project starts. The data at the individual level can be aggregated to understand business cycle conditions in the economy. It is useful to look at both series — projects announced and projects under implementation. The first gives a sense of the resources that are being committed, while the second informs us about the projects that actually take off. The investment process in India is slow, as there are many practical hurdles that have to be overcome. When an investment project starts with an announcement, there are many hoops to jump, and time elapsed, before the investment spending is done, and before the project is commissioned, giving jobs to people. It is also useful to look at public and private investment series separately. Public investment usually creates the conditions for economic activity through infrastructure investment. It creates jobs during the period when the investment is being undertaken; private investment often creates assets that will continue to create jobs. For example, public investment for a road creates jobs when the road is being constructed, and creates opportunities for economic activity and for private investment later. On the other hand, private investment in a manufacturing plant creates a factory that employs people and produces output for many years. Given the differences in the nature of the investment, and their impact, we look at both announced and under-implementation aggregate series for public and private projects. These series measure the aggregate value of the stock of projects. In other words, if a road project is announced, then until the project implementation starts, the project stays in the aggregate announced projects series shown in the graphs. As projects come under implementation, they move out of the announced series. Projects can also be abandoned and would then get dropped from the projects announced list. These are (i) projects announced – public and private, and (ii) projects under implementation — public and private. Projects announced show that both public and private projects rose till 2011, slipped after that, rose again till 2015-16, and have declined since. It can be argued that the period before the Global Financial Crisis saw exuberance and loose monetary policy, when credit was cheap and easily available, leading to over-optimism and excessive investment. Many projects got stalled as there had been inadequate planning and clearances. The fall in demand after the GFC could have further hit them. Thus, it can be argued that the decline in projects announced after 2011-12 is a correction that was due. Once this happened, when the new government came in, a host of new announcements happened, causing the blip. 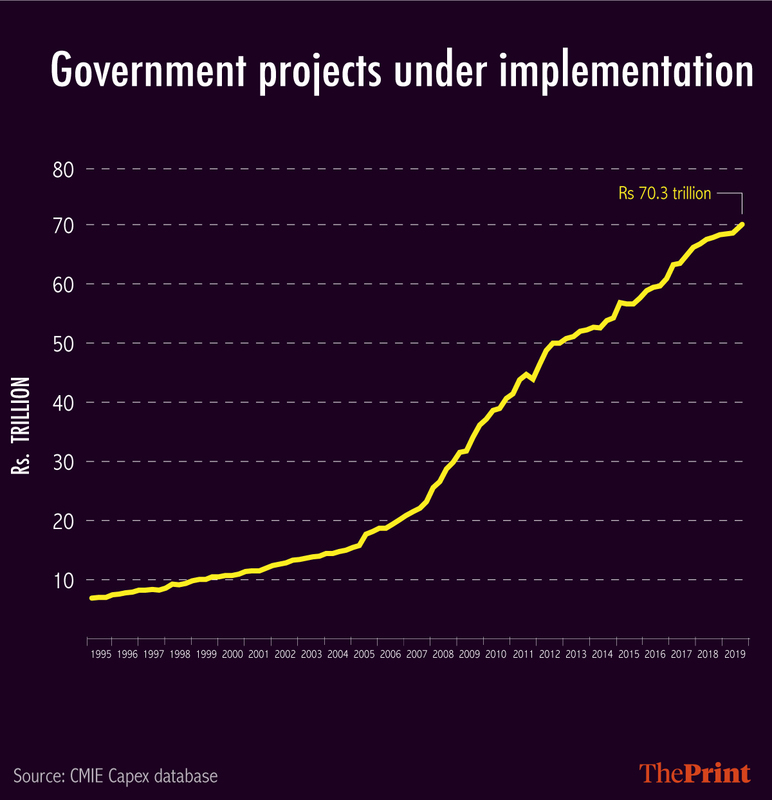 The aggregate series for under-implementation projects shows that government projects under implementation have seen a steady increase throughout. However, private projects under implementation have seen a decline since 2011-12. The decline in private announcements and projects under implementation could be both because there was greater economic uncertainty due to demonetisation, GST, the crisis in the banking sector and an uncertain tax regime. A reversal of this trend is a necessary condition for a sustained upswing in growth in the formal sector.